Gretel Mendez-Vega, 22, Killed On I-95 Near Sixth Avenue Crash | Schuler, Halvorson, Weisser, Zoeller & Overbeck P.A. 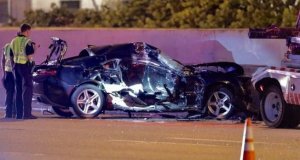 A 27-year-old Lake Worth man was arrested on DUI manslaughter and property-damage charges in a crash that killed Gretel Mendez-Vega, 22, and injured a Florida Highway Patrol trooper on Interstate 95 north of Sixth Avenue South in Lake Worth. The crash happened when the driver lost control of his 2017 Chevrolet Camaro, FHP authorities said. The car flipped sideways and struck a Road Ranger vehicle parked in the median. The Chevrolet Camaro was moving northbound at least 30 mph at the time of the crash, investigators determined. Gretel Mendez-Vega, 22, of West Palm Beach who sat in the front passenger seat of the Chevrolet Camaro was pinned inside. She was pronounced dead at the scene. Due to impact, the Road Ranger crashed forward into an FHP car causing injuries to a trooper. Both vehicles had their emergency lights on, according to an FHP report. The Road Ranger driver, 54-year-old Joseph Polynice, was not hurt in the crash. State troopers, including Cedric Mitchell sustained minor injuries in the wreck. Authorities cut the seat belt off the Chevrolet driver and laid him on the ground. He reportedly began to cough up blood and a trooper noticed the smell of alcohol on his breath, records state. He was transported to St. Mary’s Medical Center in critical condition where blood samples were taken about two hours after the wreck. According to records, at least one of the blood sample test results indicate his blood-alcohol level was above the legal threshold of .08 and also tested positive for cocaine. The 27-year-old Lake Worth man was arrested on DUI manslaughter and property-damage charges. Judge Dina Keever-Agrama set his bail at $35,000 during a hearing at the Palm Beach County Jail.